I made some more videos of a playthrough of a 15 minute game. There's only one or two glaring bugs showing up. Use this to paint your fleets. 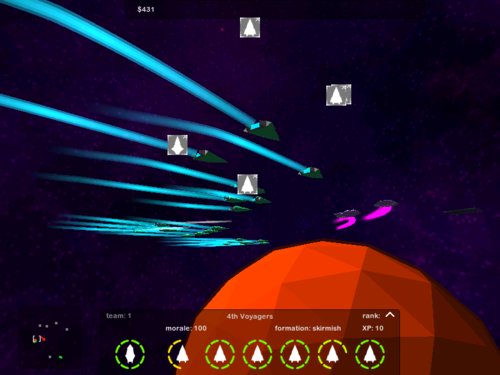 Having a variety of fleet colors and banners will be a big part of the game's visual style. You can save/load schemes by pasting JSON in the text area. Unfortunately, misformed JSON will break the painter and not really provide any feedback yet. Example: Paste this into the text area under the "Load Scheme" button, and then press the button. Press "Save Scheme" to create JSON in the textbox, save it in a file (or share it here! ), and then copy and paste it later following these directions to see the scheme. I figure I should finally get around to starting a devlog of this. I've been working on it for about a month and currently have a buggy but playable version. Sometime this week I hope to get some gameplay video up, I've never done videos for my games and it's really about time I did. It's a space RTS that tries to focus on more strategic than tactical gameplay and tries at every step to remove micromanagement and create an RTS that is more or less a single game instead of a collection of sub-games (resource collection, production, tactics) like most RTSes are. 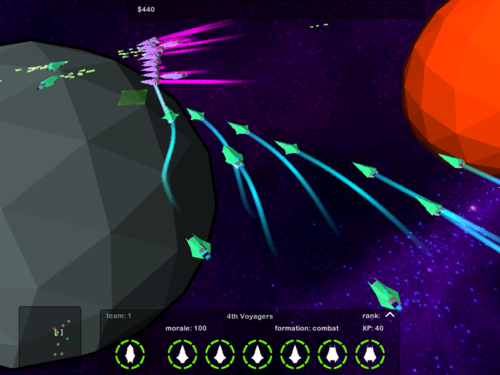 You control squadrons of ships (starting at the frigate size) instead of individuals, comissioning them from planets which in turn also heal and respawn damaged/lost ships when a squadron is nearby. You also don't control the placement of planet-based structures, you merely build them as part of the planet. If you've ever played Kohan: Immortal Sovereigns you'll notice that I am pretty much directly copying the system used there. There are some interface bugs that make the game very hard to play if you aren't prepared for them so I will abstain from posting a demo until they are sorted out. I'm also planning to probably redo the visuals a bit as well as make the camera a kind-of-freelook one like in Homeworld. 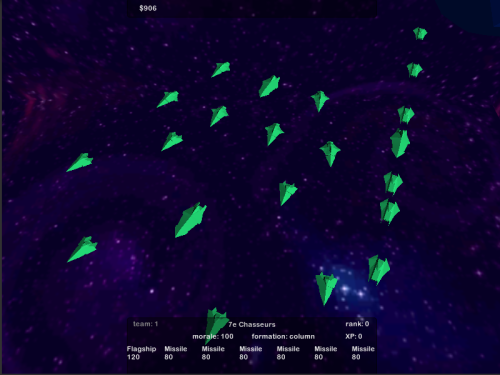 I basically just have the basic gameplay in, but even then I'm thinking I want to modify how squadrons work a bit. This already looks very interesting. Keep us updated, and I'm looking forward to a demo. I've been following this for awhile via your tumblr. First time I heard about the name though, it does sound pretty awesome. I love Space RTS games and have a sort of love/hate relationship with micromanaging and resource gathering. I like your approach to it, sounds fun. Even though you say you may plan on re-doing the visuals, I have to say I kinda like it. Reminds me of Darwinia's approach to graphics. I'm digging this, and I really like your post last week about why/how you like RTSs, I feel the same. By redoing the visuals I'm going to keep the flat shaded lofi look, I will probably just do some coloring or light texturing of the ship models, along with a self-illumination texture such that little bits of the ship like windows or engines will glow, and redo the background (which is currently yanked from the Assemblee assets) as a more nebulous... uh.. nebula-looking background. 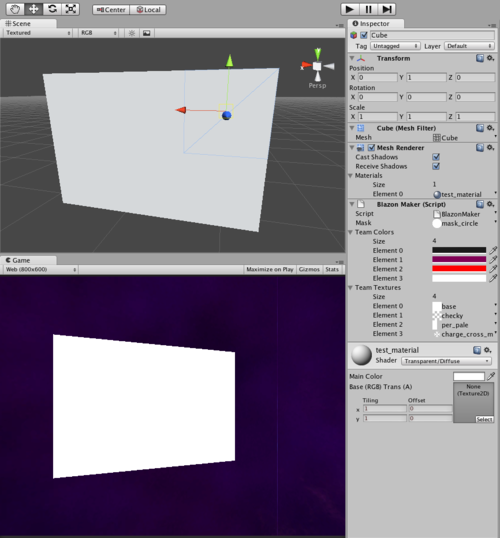 I also need to reskin the GUI slightly so it doesn't scream "hey, I'm a Unity project!". So I guess it's not really "redoing". I don't have the skills or patience to do a better-quality redo. press r to randomly switch between 4 different skyboxes. They are pretty good looking at high resolution, might clash with the overall lofi look of your game though. You could save them at a lower res or pixelate them in photoshop though. 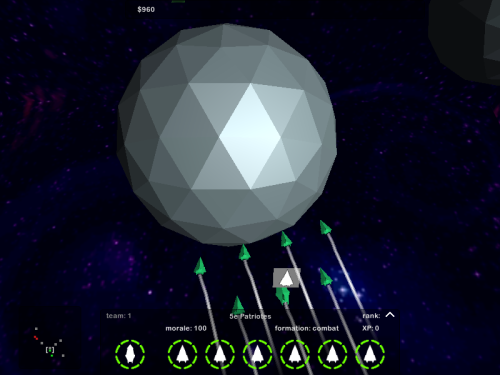 Added face colors to the ships, colored contrails, and an outline shader to the planets. I need to get back to fixing bugs that are making this game not-quite-playable. Hey there, I started working on this again about a week ago. I am too lazy to try to keep this up to date with my tumblr so I will only occasionally post in here. I will use this thread more as a means to garner feedback than to report the day-to-day status of development... I wonder if that's against the spirit of a devlog? I'm still very interested in peoples' opinions. Here's the current to-do list. - global message queue to inform player about comissioning, planet captures, squad combat events, etc. - different background : needs to match sharp lines and flat shading of the ships. Vector gradients? I am aiming for a Sept. 1st build to send to playtesters. I made a video, it's actually the first video I've made of one of my games. This is probably why the video quality is terrible. Anyone have suggestions for free screen capture + video editing software for Windows? 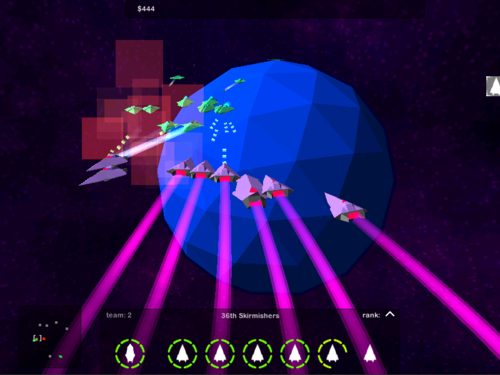 I'll try to cut down on the noise and increase the readability of combat by making ships respect each others' space. That probably won't come until next month, though. 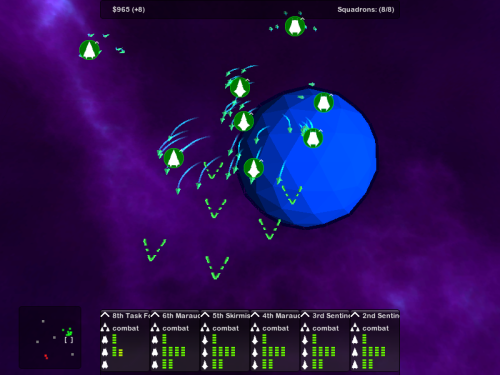 Last night I implemented the morale system so that when (rookie) squadrons lose most of their ships, they will rout. I need to work on the unit AI a bit more so they don't chase routing/retreating squads, and to disallow commanding of routed squadrons until they've "regrouped". I hope it's not too hard to sneak in directional morale "damage", so that attacking a squadron from behind or two flanks at once will cause it to rout much more quickly. I'm going to make a better video soonish, promise! Haven't posted in awhile... I'd really like some more testers! Making everything work as intended takes a long time, and I haven't even really seriously tried polishing anything. I want to start working on the overgame but the basic tactical game is nowhere near finished. I need to at least get it pretty solid before moving on. One of the more interesting pieces of code I've written is the one to make blazons. I plan to have them all be procedurally generated using real-life heraldry standards, with a few modern colors and fictional charges (symbols), so that empires, kingdoms, duchies, counties, baronies, and the dynasties that rule them will all have some strong symbols to go along with them. 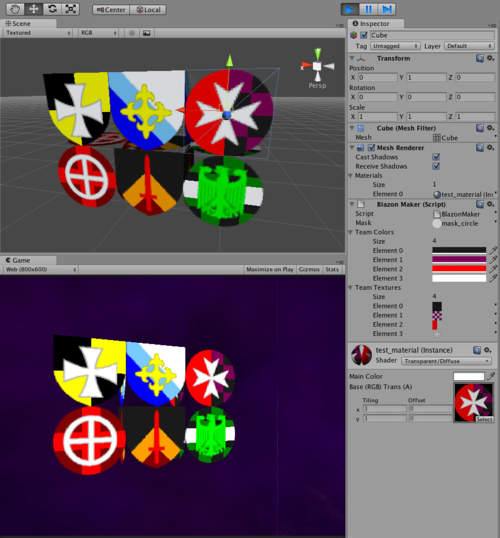 Currently I have a component that lets you hand-create blazons using colors you choose and a small set of ordinaires, charges, and patterns. Finally got working on this project again! I have a crapton of ideas for the campaign mode, and I feel it's going to influence the tactical battles so much that I should at least get some basics done. Recently I got some basic galaxy generation going (just white orbs for now) and blazon generation. I have tweaked the algorithm and inputs from "hideous" to "sometimes good enough", so I will get started on generating houses full of nobles next, who will be given titles to planets that will then bear their house's banner. 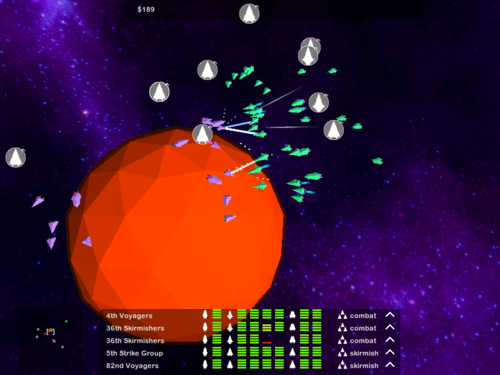 Then, finally, it's on to basic ship/fleet management and giving players the ability to attack each others' planets. I am thinking of an interesting twist, but will save revealing it until the system is actually implmemented. Oh, also, I decided the private playtesting thing doesn't really work, at least if you can't attract a ton of super-hyped people. Thus, I will try to get a demo out in the coming month or so, once stuff is moderately playable. I shall of course sign on to serve with Her Majesty's Royal Space Armada forthwith upon the very moment the recruitment office opens its doors. We must all do our part for queen and planet. I'm moving away from the "jumble of planets" map to a "one or maybe a few planets, with various capturable bases" map. 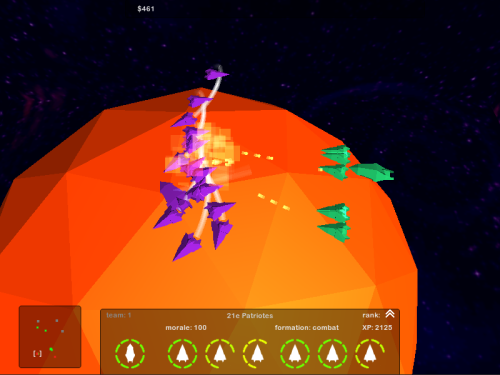 I still need to completely rework combat, though, since it is still basically a practice of throwing masses of ships at each other. Lots of plans, but not enough time spent implementing them! The big spearhead shaped pieces revolve around the center. To make any ship model I sketch out a vague idea of what I want (in this case, big triangular things protruding horizontally or vertically from a central spindle / fuselage) and just fool around in the modeller for an hour or two until I get something that I think looks cool. I then proceed to assign UVs to "color" the model, and create various minor touches like the horizontal lights on the spindle, stripes, or antennae.